Whatever passion you’re pursuing, the Pursuit can provide a comfortable living space wherever. 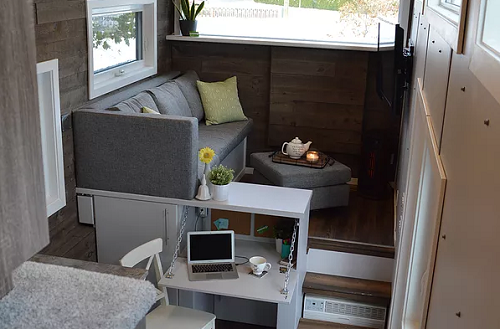 The Pursuit is an elegantly designed tiny house that can be customized to suit any lifestyle or activity. This house is meant to be an alternative to rentals, mobile homes, or small getaway homes that cost a fortune to build! The 24-foot Pursuit boasts of a rustic modern exterior crafted from a mix of cedar wood sidings and Hardie panels. It also features a Prolock metal roofing system and spray foam and fiberglass insulation. The exterior features several double glazed windows to maximize the natural light, perfect for camping out in the woods or taking on a wild adventure. There is also an 8′ x 12′ composite deck for days when you just want to relax and take in the view. Step inside the Pursuit and you’ll be greeted with bright and cheerful 280 square feet of living space. The interiors are divided into three rooms, the first being the galley kitchen. 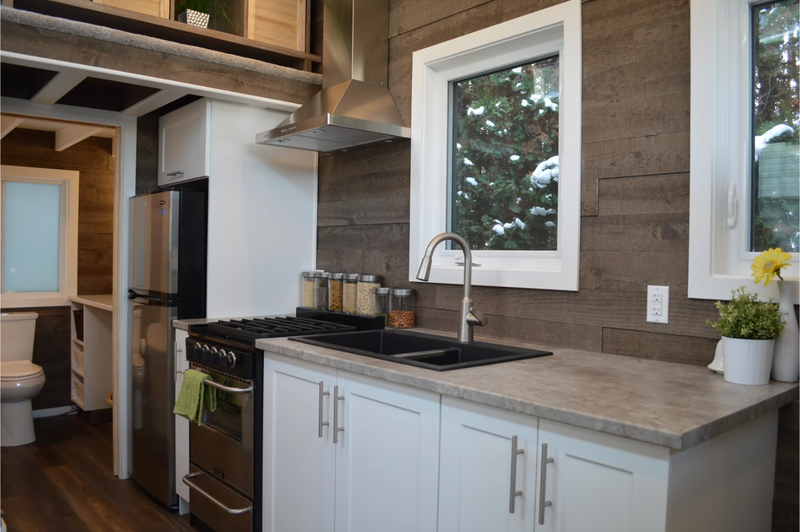 The galley kitchen features a custom pantry, a propane oven/range with a stainless steel range hood, a fridge, a pull-out spice rack, and a couple of roomy cabinets for extra storage space. If you need more room, you can request for open or closed shelving installed above the sink and counter windows. To maximize the storage space, the staircase pulls double duty as cabinets. 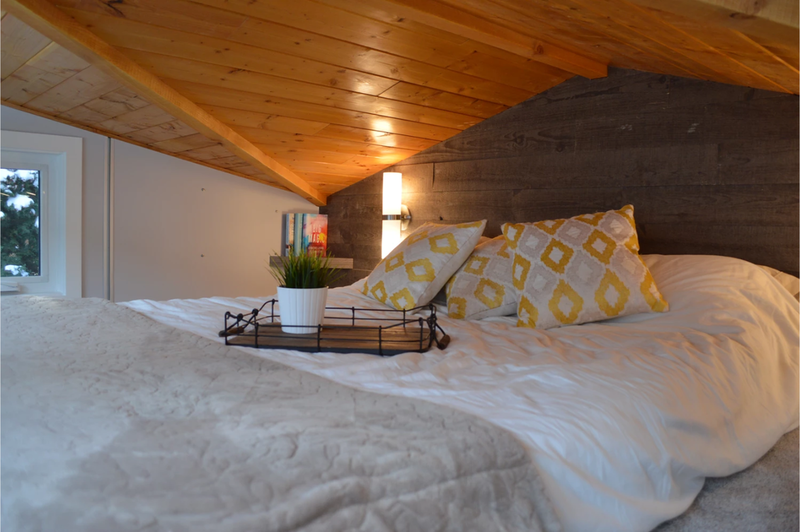 The loft bedroom features an intersecting gable roof line to maximize the headroom. The bed’s headboard is the feature wall. The full egress window is designed for your safety during an emergency. Open shelves are also installed in the back corner for added storage space. The lights come with 4-way switches near the bed for a comfortable slumber. 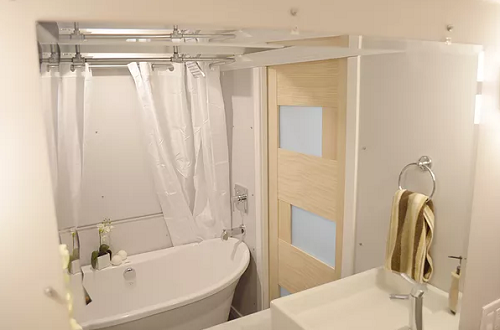 A few steps from the kitchen is the bathroom, which may look tiny at first but it comes with a full-sized bathtub, a flush toilet, a vessel sink and laundry hookups. The bathroom is plumbed and wired for a washer/dryer combo unit. Beautiful chrome fixtures, frosted glass windows, wall sconce lighting, and vented exhaust fan are added to give the bathroom a luxurious look and feel! The living room is set on a raised platform for definition. 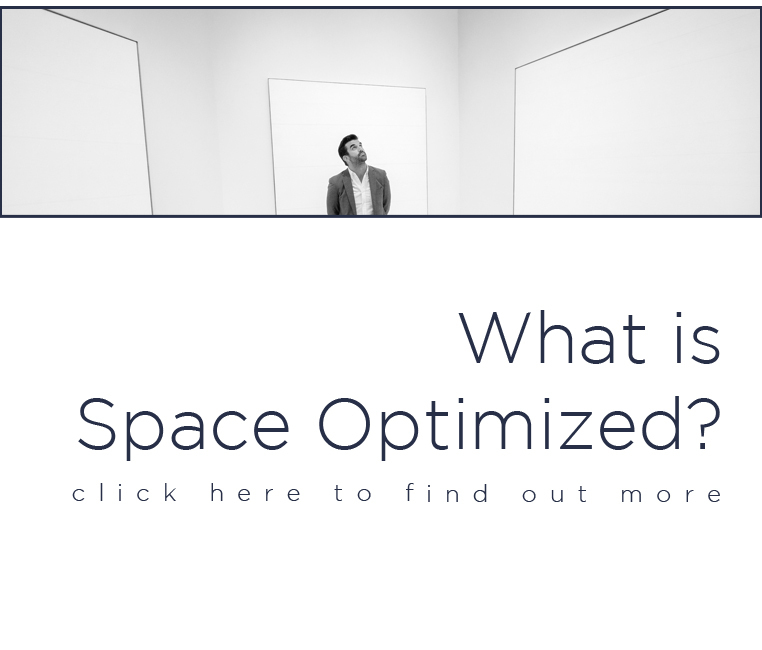 This space comes with a custom couch with hidden storage space underneath. A built-in desk and front hall closet ensures that you get things done even while on a break! A dining table is also installed near the living room and it can seat up to 5 people. A floor hatch and crawl space are also added to stow large and seasonal gears. The living area also features a 20″x 90″ full tilt TV mount, electric heater and AC unit, angled windows and dimmable mood lighting. The paneled walls are insulation with spray foam to keep the living room nice and toasty during the winter season or cool and comfortable all summer long. For utmost mobility, the Pursuit comes with its own trailer, called the Rainbow trailer. 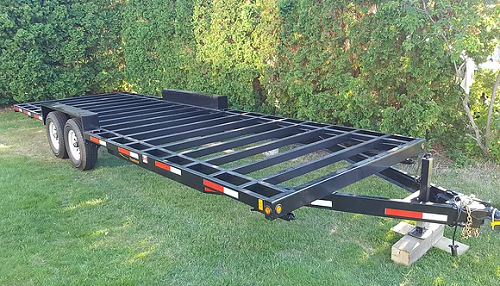 The Rainbow trailer is customized to be the ideal foundation of the Pursuit. 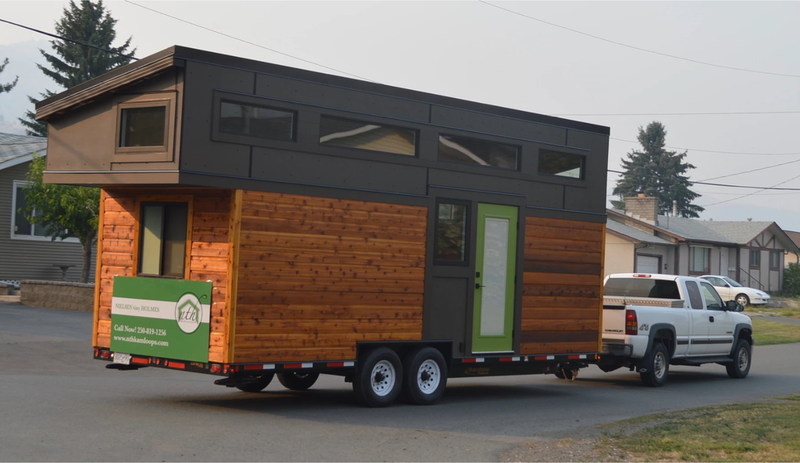 The Pursuit is designed by Neilsen Tiny Homes, a builder based in Kamloops, British Columbia. 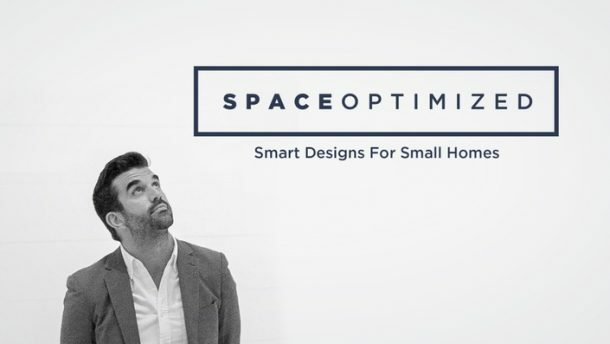 According to the company, the Pursuit was created to make portable yet stylish homes even more affordable for homeowners. The company is happy to work with interested parties to develop customized homes that suit a specific budget. A standard Pursuit mobile home will set you back $86,587. 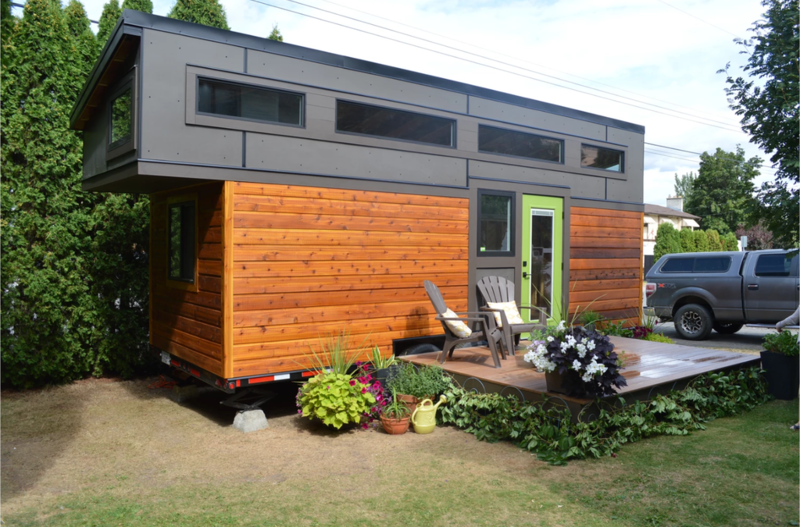 For more information, contact Neilsen Tiny Homes here.